Even if you’re not a football fan, or you’re forward-deployed, or you’re in a submarine under the Pacific with your fingers in your ears humming “Anchors Aweigh” as loud as you can, you’ve probably heard the news: Quarterback/attention magnet Tim Tebow has been dealt from Denver to the New York Jets (probably) to make way for another quarterback of note. Even before Peyton Manning forced his latest PCS move, Tebow couldn’t help but make headlines for some reason or another. But one of his recent endeavors didn’t get much press: a visit to a wounded warrior in Florida as part of a fundraising event. 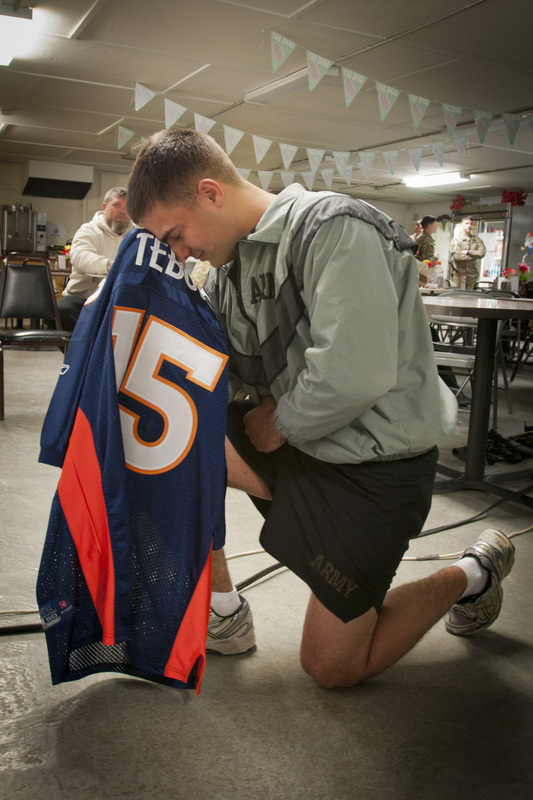 Chief Warrant Officer 2 Romy Camargo, an Army Ranger who was shot in the neck during a combat mission in Afghanistan and paralyzed from the neck down, met Tebow on March 9. Army Times wrote up his story briefly in its print edition (subscribe here to read it online), and a video from the event shot by a local Fox TV crew is here. Oh, and the guy on the right with the suddenly outdated merchandise? Get more on his story, and a dose of war-zone generosity during last month’s Super Bowl, here. Veterans Fire Corps Crew Leader having some fun near Dolores, CO. This video made it on Fox 31 Denver and a Top 9 Sports Moment for 9 News Denver back in December!